There was no time to relax by the pool for staff at Holiday Inn Pattaya and Regents International School Pattaya on 25 and 26 October. The British boarding school and the family-friendly hotel worked together over the busy Chulalongkorn weekend to offer children on vacation two fun-filled days of English-language activities. “Adventures in English” is the British school’s unique English-language activity programme, designed to show children aged 5 to 13 how much fun learning English can be. Over the course of two days, Mr Jamie – one of the teachers at Regents – and his assistant Ning guided the children through activities like ‘the jungle’ and ‘the underwater world’. 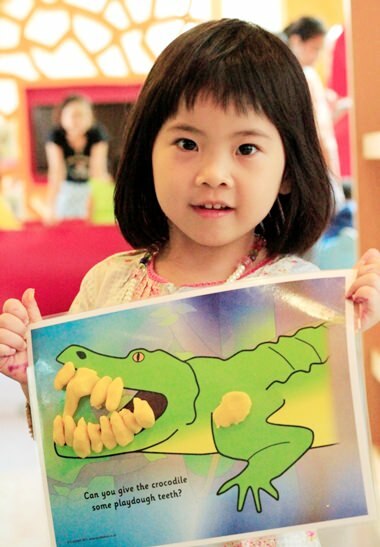 These adventures took place in the hotel’s colourful Kids’ Club, where the youngsters laughed, learnt some new English phrases and created some wonderful artwork. Children on vacation enjoyed two fun-filled days of English-language activities. “At Holiday Inn Pattaya, we celebrate family time, and the precious moments families can have on holiday together. Adventures in English is one of our various activities made keeping in mind our very special guests – kids. This activity combines fun with learning, giving mums and dads the chance to make their kids’ holiday truly memorable one. Kids are really special to us. That’s why at Holiday Inn Hotels & Resorts worldwide, kids stay and eat for free – making it that much easier to turn holiday dreams into reality without breaking your budget!” said Kate Gerits, general manager of Holiday Inn Pattaya. 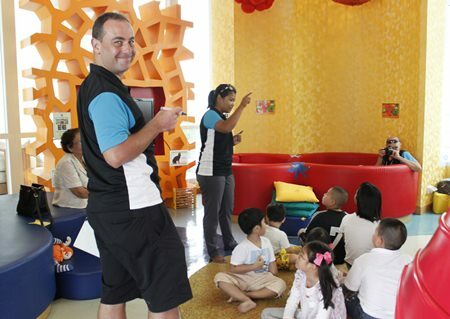 Mr Jamie and his assistant Khun Ning guide the children through activities. Both the hotel and the school are looking forward to offering another round of Adventures in English later this year. The kids learn some new English phrases and create some wonderful artwork. One of the young guests with her masterpiece.